A Compact Tractor at a Compact Price, Without Sacrificing Features. Compact Farmall C deluxe series tractors are go-to workhorses, because of their size, maneuverability and physical capabilities. From moving mulch with a loader to blowing snow or digging with a backhoe, they are built tough and with plenty of power to get the job done. Noise Reduction: A thick rubber floor mat dampens noise and vibration, reducing operator fatigue, and helping you stay more productive all day. Handy Storage: Whether a place for hitch pins, a pair of pliers or an afternoon snack, a handy seat-side storage compartment within easy reach fits the bill. Plus, you’ll never leave the farmstead without your operator’s manual and other important documents using the convenient seatback storage space. Unobstructed Views: The operator’s platform provides excellent all-around visibility from the tractor seat, including rear visibility to the drawbar, PTO and 3-point hitch. The stylish, sloped hood on Farmall series tractors allows clear, forward sightlines to the front wheels, loader and other mid- and front-mount attachments. Sure, the engine, operator platform and overall aesthetics help make the tractor. But it’s how implements attach, function and power up that make your tractor a versatile workhorse. You can count on Compact Farmall C tractors for features, plus reliable ease of use for efficient productivity. Mid-mount PTO: Power mid- and front-mount equipment, such as mowers and snow blower. A factory-installed mid-mount PTO comes standard. Speed Options: A rear, independent 540-rpm PTO with electro-hydraulic engagement comes standard and drives all your 3-point-mount and pull-behind implements. The mid-mount PTO is manually engaged, but controlled with electro-hydraulic PTO switch and operates at 2,000 rpm. Flow Rate: An 8.2 gallons-per-minute hydraulic flow gives you the power you need for all kinds of heavy lifting, from loaders and backhoes to rear blades and rotary tillers. Remotes: All Compact Farmall C series tractors arrive from the factory with a standard rear remote and mid-mount valve. For even greater flexibility, add an optional second rear remote. Plus, optional color-coded rear remote levers and couplers simplify hookup. 3-point: Telescoping stabilizers and flex-end lower links make attaching and hooking up implements fast and easy. A single turnbuckle levels attachments. Mechanical positioning and an adjustable drop rate give you even greater control. Extendable Drawbar: A two-position drawbar lets you customize hitched implements to your desired position or move the drawbar to keep it out of the way when not in use. All models feature standard 4WD for improved traction and increased power to the ground. ROPS models include fenders and handles for easy entry and exit. Case IH compact Farmall C tractors boast some of the best maitenance intervals in the industry. New compact Farmall C "Series II" tractors come standard with a 6-year extended warranty. That’s 72 months with peace of mind at no additional cost. A loader or an attachment turns a tractor into a versatile, powerful workhorse. Plus, Curved-boom loader arms let you easily see to the top of the bucket and around the front tires for maximum visibility. The Case IH L300A loader series is designed specifically for use with your Compact Farmall C tractor. Each tractor arrives from the factory with standard, loader-ready features, including a mid-mount hydraulic valve and console-integrated joystick controller. Each loader includes mounting brackets for its corresponding tractor. Quick, easy mounting is a hallmark of Case IH loaders. Simply drive the tractor into the loader, put in the pins, attach the hydraulics and get to work. Your Case IH dealer offers a full line of attachments to help you get the most productivity from your Compact Farmall C series tractor. Implements are quick and easy to hook up and include front-, mid- and rear-mount options, ranging from mowers and rotary tillers to blades and snow blowers to backhoes and rotary cutters. Featuring 40 HP and up to 34 PTO HP, the compact Farmall 40C is designed to perform a wide variety of tasks. The compact Farmall 45C is the right size for a large variety of tasks. Featuring 45 HP and up to 38.2 PTO HP, it can adapt to your operation's needs. 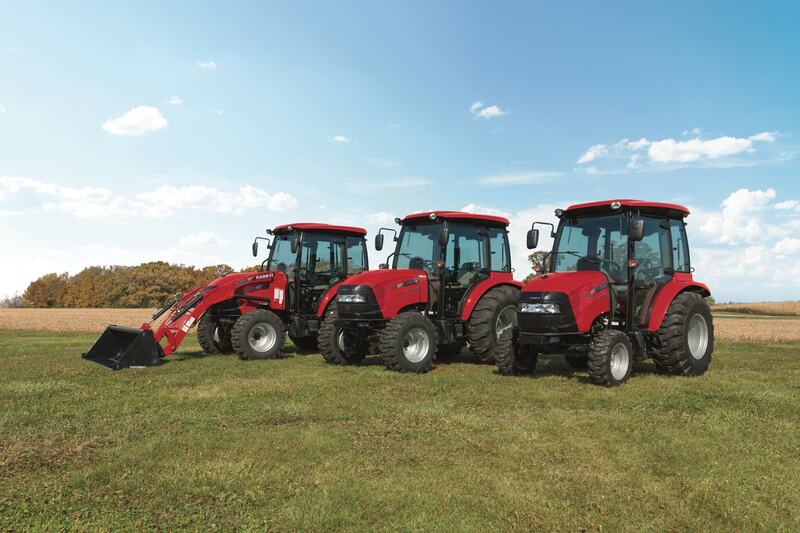 ​Compare our compact ​Farmall C series​ tractor specs to other manufacturers' compact tractors.